I want to switch from YNAB4 to nYNAB. At least, I think I do. But I haven't yet because I can't wrap my mind around how debt and reimbursable expenses work in nYNAB. Here's my situation: I have thousands of dollars of healthcare expenses and reimbursements that I have to float for up to 8 months, involving both a checking account and a credit card. It gets overwhelming and discouraging when nYNAB just lumps it all into a big, angry debt monster instead of the way YNAB4 kept it in the healthcare category where I knew what it was and that it would be reimbursed eventually. I don't have enough extra money to budget for the healthcare expenses until I get reimbursed without completely strangling all my other categories. I need my reports to accurately reflect my copayments (that I do budget for because that portion is not reimbursable) and the amounts of the reimbursable portions and the actual reimbursements. This is my reality. It is super frustrating to feel as though nYNAB is trying to force me into a rigid structure that doesn't fit a reality that I have no control over. I'm hoping there is a way to handle it and that I just haven't found it yet. I have registered for the credit card webinar class, but I'm not sure that is where my answers are. I need some encouragement and additional ideas. Please post links to help docs or (?) that can offer insights into the situation. Hi JGM -- what a tough situation! Let's see if we can make it easy. How to handle reimbursements is an important topic, so a section of our Help Docs is dedicated to it. Here's a quick summary, and you can follow the link to learn more. To keep track of what you're owed over time, you'll want to create a Tracking Account. Here's a quick video on how to do that. The balance of the Tracking Account will be what you're owed. I’m going to mark this as answered, but please feel free to tag me in a reply if I can tie up any more loose ends for you! I pretty much do exactly what YNAB recommends as pointed out in the links @jen_c posted as resources. If you are like me, you need to see it in action to be convinced. I suggest you open a new budget called Test to try out a few concepts before committing. I pretty much have to try things out to completely understand them. I've created a step-by-step example for you to test to see if it would work for you. 1. Create a test budget. 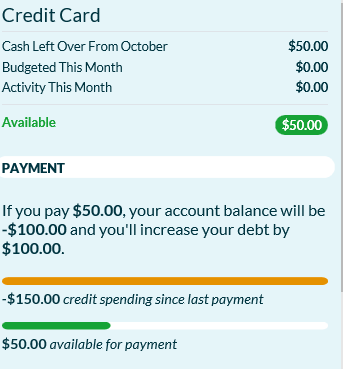 you can add some funds to your chequing account to complete the test - I would date the inflow in the previous month so you can see how the month transition affects the budget display. Entering it this way will separate the two portions of the expense, and it will increase your Medical Claim account by the amount eligible to be claimed. And this is how it will appear on your budget screen. Notice that I budgeted $50 for my portion, and that I did not budget anything to the reimbursable portion. YNAB moves $50 to cc payment and shows the overspend in the other category in orange. When you receive funds from a claim you record it as a transfer from Medical Claim to Chequing and categorize it as Income to be budgeted, then budget it to your credit card. I'm sorry to hear about your health troubles. Hope this helps. Thank you HappyDance ! That was super helpful, especially all the pics! WordTenor I've seen your work answering other questions. Do you have any additional insights for me here? THANKS! You wrote, "When you receive funds from a claim you record it as a transfer from Medical Claim to Chequing and categorize it as Income to be budgeted, then budget it to your credit card." However, whenever I tried to transfer money to a budget account (i.e. 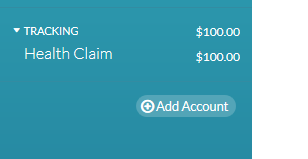 my checking account), I was not allowed to assign a category. Any suggestions on a fix for this? When transfering between a tracking account and an on-budget account, work in the on-budget account. A tracking account doesn't interact with the budget. That's why a category can't be entered there. But you will be able to enter the category in the on-budget account whether the funds are inflowing or outflowing. If you already created the transfer in the tracking account, you don't need to delete it, just double click on the corresponding entry in the on-budget account and revise it to add the category. The category will only appear in the on-budget half of the transfer. Here's one of my recent transfers. The first view is in my tracking account register. Note: no category. The second view is in my on-budget chequing account, where I chose to inflow the reimbursement directly to my Loony Fund (the category I use for office expenses). HappyDance yes! Thank you so much.